Also known as the III Torneo Internacional de Palma de Mallorca, the tournament was sponsored by the publishing corporation Asociación de la Prensa de Madrid. It followed up the successes of Palma de Mallorca (1965) and Palma de Mallorca (1966), and was continued with Palma de Mallorca (1968) and Palma de Mallorca (1969), until the event culminated with the organization of Palma de Mallorca Interzonal (1970). 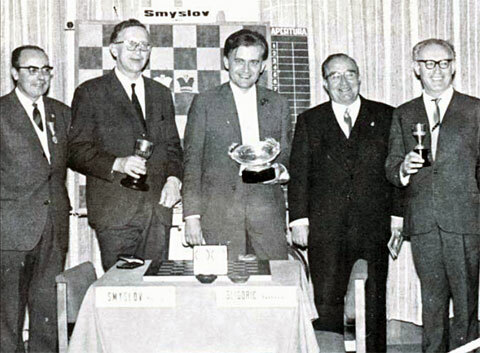 The field contained six IM's and 10 GM's, including Portisch (#12 in Chessmetrics* world ranking), Larsen (#11), and the Russian ex-world champions Smyslov (#8) and Botvinnik (#7). In the end, these four highest ranked also took the first four places. Diez del Corral achieved his 3rd and final IM norm. NOTES: Botvinnik, Smyslov and Jiménez arrived late for the tournament, and their round 1 games were played between rounds 4 and 5, on 1 December. *http://www.chessmetrics.com/cm/CM2/... #Wikipedia article: Ciutadella de Menorca, where the players went by plane. Original collection: Game Collection: Palma de Mallorca 1967 by User: Tabanus.